Now that MUNI is on the way to being a play machine, we unwrapped the rope delivered a couple days ago from Petco. MUNI pretty quickly understood its purpose and approved. Aunt Apex, on the other hand, wanted everyone to know that she was the Original play machine. All toys should be hers first, she says. Day 42 – Introducing a New Toy to MUNI.. But Apex Wants It! 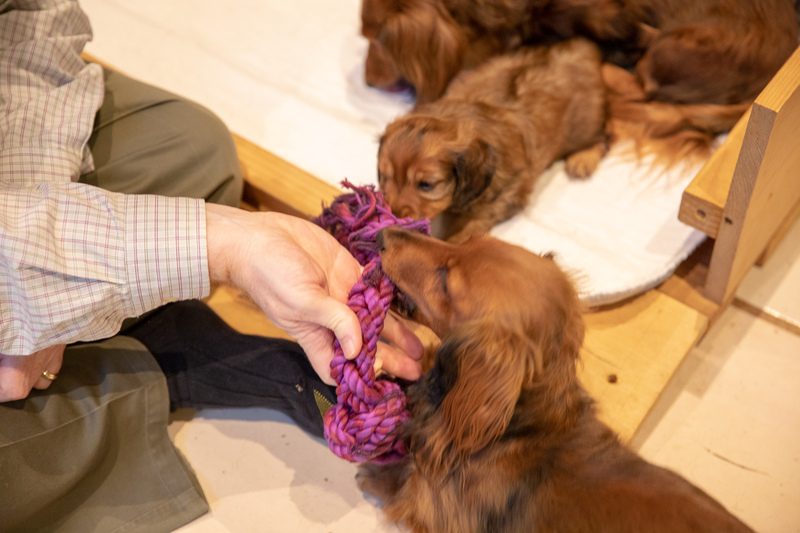 We are struggling to teach Apex and the other adults that toys that are in the whelping box can be played with, but NOT removed from the whelping box. Apex wants to take the teething ring, plastic bone, and now the rope into the Outback where she can dispose of them at her leisure. Of course, the play session and our attempts at training the adults are great fun for us all. We think that even Apex has avoided having her feelings hurt when we make her share one end of the rope with MUNI! No special visitors today. Just honorary pack member Tony who came by for supper. So, it was a quiet, but playful, day. This entry was posted in dachshunds and tagged dachshunds, Day 42, MUNI, puppies2018, zenith puppies. Bookmark the permalink.